“It was minimal,” Hannity responded. Yes, just like Trump hardly knew that guy, Comey. If Hannity gets fired, maybe he can work for Trump in the White House. That would make the BINGO cards more factual. He hasn't found anyone for Hope Hick's old job yet has he? They only advised him on real estate deals and he never paid them. Fox News anchor Shepard Smith described Sean Hannity being the third client of Michael Cohen, President Trump’s personal attorney, as the “elephant in the room” during his Monday afternoon program. Shep Smith is bright-eyed and happy in this still. It's OK, Dan, WE still love you. It depends. How much is he paying? How did Hannity stumble into Cohen? Was Cohen recommended by Trump, or did Hannity hear that if he consulted Cohen he might just bump into Trump at Cohen's office? Cohen is not the first lawyer that Trump and Hannity have shared. He's actually the second! Last year, Hannity ALSO hired Jay Sekulow who is on Trump's Russia legal team. Maybe because it was lifted from Groucho Marx? She should be. The circus was in town and she and the Chin didn't even get in the center ring. The crimes against fabric in this photo should be carrying their own jail time. 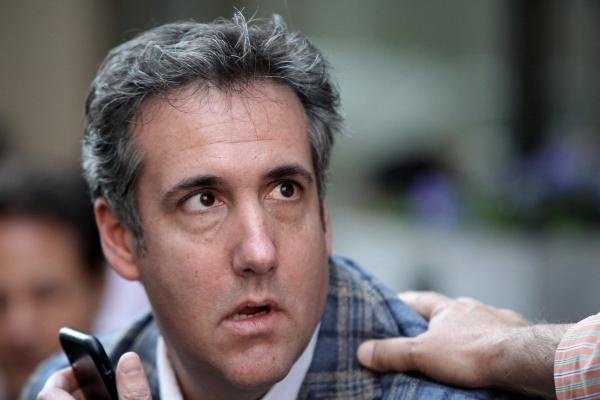 Just so it doesn't get lost in the noise, I want to remind everyone that Mr. Cohen is an esteemed graduate of the Thomas M. Cooley School of Law which makes him a better-educated lawyer than Orly Taitz. You have to give him credit for realizing that he isn’t particularly lawyerly and is better at being a pretend lawyer (and trying to push people around). Orly on the other hand, thinks she is competent. What I didn’t realize until now is that both Agron and his successor Balagula ran their operations out of an office in the El Caribe social club. So the El Caribe wasn’t just a mob hang out. From the 70s through the 90s at least, the bosses of the Russian mafia in the U.S. literally ran their crime organizations out of the El Caribe. So Michael Cohen’s uncle Morton Levin’s social club was the headquarters of Russian organized crime in the U.S. I am surprised that Michael Cohen has not yet met with a 'misadventure'. The simple fact, as regards The Don, is that Cohen knows too much. Perhaps we will hear that Cohen has succumbed to some sort of nerve poison seldom seen in the US.